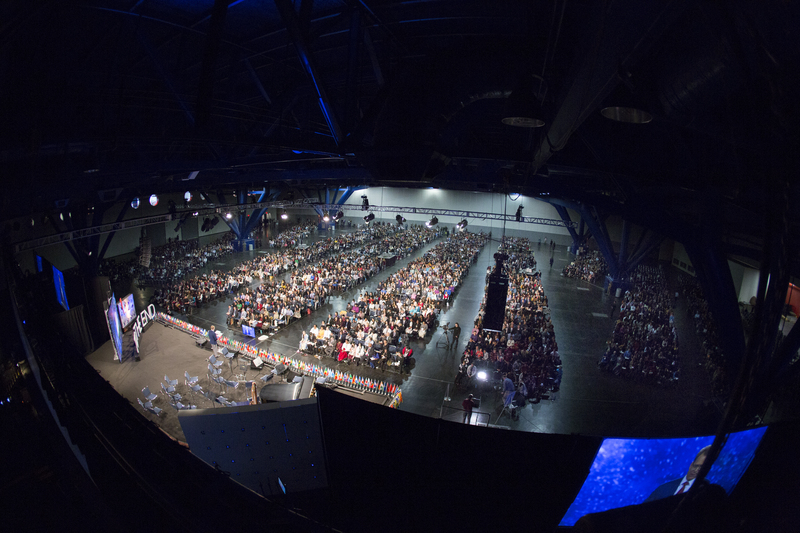 With the theme To the End, the 2018 Generation of Youth for Christ (GYC) national conference convened in Houston, Texas, United States, from December 28, 2018 to January 1, 2019. Each year at the end of December, GYC brings together young participants from around the world who are eager to grow their spirituality and be fed solid spiritual food, organizers said. At GYC, participants have the opportunity to engage in outreach in the community, hear various sermons, interact at the networking sessions, and take in music and testimonies. Participants can also connect with supporting ministries and discover opportunities for service in the exhibit hall. According to the GYC website, the organization was founded by a small group of young people in 2002 who desired to delve deeper into scripture and study it for themselves. They wanted to have a revival similar to the excitement and power experienced during Pentecost at the beginning of the Christian church. GYC leaders said that this year’s conference was intended to instill in people the idea that God does not want to leave anyone behind. As Seventh-Day Adventists, do we step out of our comfort zone or do we stay in our little Adventist bubble, content to let the world perish all around us while we wait to go to heaven? they said. Moise Ratsara, current president of GYC, shared with participants in his sermon on opening night that God is not willing to lose one person on earth to sin. The reason God sent His Son is that we would otherwise all be lost, and God wanted to give fallen humanity the opportunity to be saved, explained Ratsara. God went to the end literally to save us, so will we go to the end for Him? he asked. GYC president Moise Ratsara shares the keynote message on opening night of the annual national convention at the George R. Brown Convention Center in Houston, Texas, United States. Flags on stage represented the nations from which attendees came. Steven Conway, a pastor from the Michigan Conference, told participants in his presentation, “We cannot reach the ends of the world until we first reach the end of ourselves.” Going to the end does not always mean heading off to some faraway place to serve God in the jungle, he said. It may mean serving God by being a light and witness to those closest to us, our families. The people we know best are sometimes the people we forget about because our focus is on reaching others. The outreach opportunity for GYC attendees this year took place on Sunday afternoon. Participants had the option of traditional door-to-door outreach or could reach out to refugees and immigrants from around the world living in Houston, Texas, who speak more than 145 different languages. It is GYC’s hope that this outreach would help people realize that serving God goes a lot farther than the traditional means of outreach, organizers said. Representing God to the world around us involves the little things in life, like being welcoming to our new neighbors on the street, helping out at the local soup kitchen, or teaching English as a second language, one GYC leader said. Some GYC participants went door to door collecting brand new items to put together for refugee kits. These kits would be assembled and distributed during the GYC post-conference outreach effort. GYC attendees who signed up for the post-conference effort revisited refugees to deliver the kits and also revisited homes where residents had requested Bible studies during the initial conference outreach, to begin studies with them. This is the first time GYC volunteers have returned immediately following an outreach effort to contact residents who made a decision to study the Bible, organizers said. GYC 2018 attendees load into buses for Sunday’s outreach activity in Houston, Texas, United States, on December 31, 2018. The GYC annual conference is organized by both the organization’s executive committee members as well as by hundreds of volunteers. This year’s GYC conference also had a dedicated media team that served in various capacities throughout the conference, organizers said. The team was led by Clive Coutet, media director at Weimar Institute in Weimar, California, United States. Coutet had been a photographer and videographer for GYC for several years in the past. His six-person student team from Weimar managed Instagram stories for the GYC conference, recorded mission stories and testimonies from participants, and captured footage of the conference that will be used in the upcoming trailer for GYC’s next conference. “It’s been powerful passing on years of knowledge and experience to a new young generation of media evangelists,” Coutet said. This year, GYC conference participants also had the opportunity to do something a little different during the networking session, organizers said. A new workbook was created by Eric Louw, vice-president of networking for GYC, entitled Activate. The workbook helps people find God’s calling for them in life and helps them achieve their God-given life goals and plans. Each evening of the conference, participants got together in small groups based on where they live in the US or in the world, and each one had an opportunity, alone and as a group, to complete the workbook chapter assigned for that day. GYC attendees fill out the Activate booklet in groups during an evening session at the 2018 national conference in Houston, Texas, United States. On Saturday (Sabbath) afternoon, Tara Vang, GYC vice-president of evangelism, gave her testimony. As a person who was a refugee herself, Vang’s message was timely for the age we live in, one leader said, when it seems as though we are constantly learning more about refugees from all over the world. At the end of her testimony, Vang gave an appeal, asking participants to come forward and sign up for mission service. One participant approached Vang the following day, she said, asking her if she could still be counted among those who came forward for the appeal, since at the time she had not been wearing her event name tag and had not been counted. Young people are hungry for action, Vang said. They are eager to be more than what society thinks they can be. Young people are invited to get involved with GYC, Ratsara said, and they can also discover service opportunities that are available by looking at the GYC website. The next GYC national conference will take place in Louisville, Kentucky, United States, January 1-5, 2020. This article was written by Seth Shaffer and originally appeared on AdventistReview.org. It is reprinted here with permission. Photos courtesy of Seth Shaffer/Adventist Review.